Quite a collection of meteorites (alt.) has come together already in the days after a bright fireball streaked over Wisconsin and several other U.S. states late on April 14! A lot more reports - in no particular order - about the bolide and the string of meteorite recoveries can be found here, here, here, here, here, here, here, here, here, here, here, here, here, here, here, here, here, here, here, here, here, here and here. • Meanwhile a "meteorite" fall in Israel quickly turned out to be nothing of the sort; the hot temperature had shown that early on. • And the Lyrids of 2010 delivered an average ZHR of ~15. and is now P/2010 H2 (Vales): prediscovery observations, the actual discovery, also reported here and here as well as by the discoverer and images and reports of April 21, April 20, April 19, April 18 (more, more) and April 17 (more, mehr). 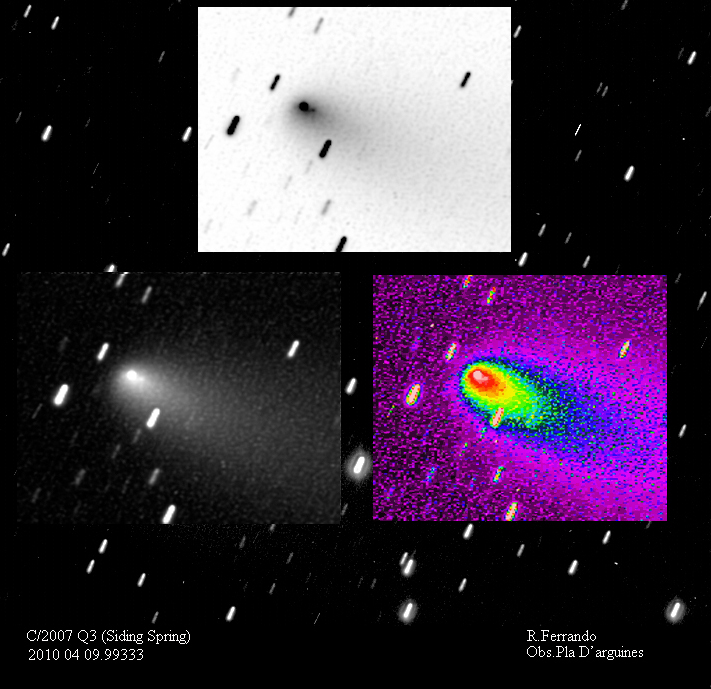 • A fragment has apparently broken off comet C/2009 K5 as images from April 24 show; on April 25 the comet was inbetween a galaxy and a star cluster (description, b/w version; animation by different observers). • Details about the current outburst of comet SW1, also an April 5 picture. • P/2010 A2 on April 17 with a star cluster and April 7. • Siding Spring on April 22, April 17 and April 12. • Comet Wild on April 16 and April 10 (from this observatory in Namibia). 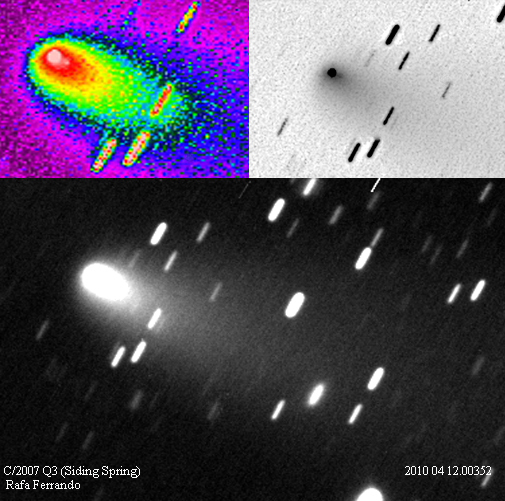 • A new Comet C/2010 G2 (Hill). • Studies of Churyumov-Gerasimenko's coma (also the German original). • And Ulysses data show that McNaught had the longest tail ever, plasma-wise (another and another press release and a story). Neptune is currently close to where it was discovered; next year it will have completed one orbit. • Saturn on April 24 (more, more) and April 23 (more, more), with various moon shadows in transit (compare that to these and these 2009 reports), and April 12. • Mars on April 20. 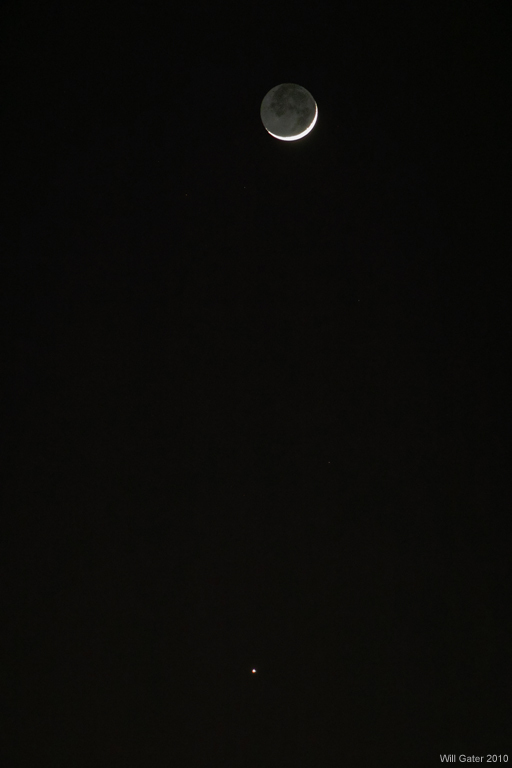 • The Moon/Venus/Mercury evening show in a composite and invidually on April 17 from Germany (more, more), April 16 from the U.S. (more), Italy (more, more), the U.K. (more, with Venus close-up, more), the Isle of Wight, Germany (more) and India (more in the stream) and April 15 from the U.S., from the U.K. and Germany (more). was successful on April 14 - but an elongation record as claimed it was not: Already in in 2008 the Moon was imaged at the same distance from the Sun! • Two solar prominences on April 25, a CME movie of April 13 (stills, a still), sunspots on April 6 and Proba 2 observations of April 3. Plus science news on a CME tracked from Sun to Earth all the way, ACE & STEREO in space weather forecasts and yet another Sun/Earth climate claim, also reported here, here, here and hier. And how the Earth's orbital changes affect its climate. • A possible nova in Sco (pics), a nova in Sgr, more analysis (ctd.) of the Eps Aur pics and the Nature paper as a preprint, plus a cataclysmic variable in the Kepler field. • The ISS in transit over the H-Alpha Sun, a lot of hi-res ISS and Discovery images here (also a Discovery flare), here (explained here), here (analysis), here and here - plus the view down at night! The eruption of Eyjafjallajökull (the pronounciation is given here at the end!) had mostly subtle effects on sky colors and visibility as already outlined here a week ago as well as by seasoned sky observers here and here. Sometimes observations were attributed without evidence to the volcano's ash, and it remains to be seen whether the sky near the Moon has something to tell. Hard data on the state of the atmosphere over Europe have been collected a lot with more sophisticated means and are summarized e.g. hier, here, here or here. There is a detailled report (earlier English version) about the 1st DLR research flight of April 19 (mehr, mehr, mehr, mehr, früher, mehr), and there was a 2nd flight (outcome and conclusions). Also reports about another, another and yet another research flight and groundbased work in Stuttgart, Hamburg and Hohenheim plus from the Helmholtz Soc. (more). Some thoughts on the real danger (more), a lot of satellite pics (also from Radarsat 2, Proba 1, ALOS, EO-1 [also from yesterday] and Terra), a dramatic video with shock waves in the plume and another one, pictures of flashes in the plume, general thoughts about volcanism in the solar system, what Earth has in store and what the plane-free skies meant, some pseudoscience and also some humor (more, more). • The variation of NLCs has been modelled. • And particle acceleration over thunder clouds. When the approaching rare eclipse of Eps Aur was advertised in earnest in 2008 it was mentioned (3rd graf) that optical interferometers would try to watch 'close-up' what was happening in that mysterious system. This week we learned that the technique has succeeded! A sequence of interferometric images with the Michigan Infra-Red Combiner (MIRC) instrument at the CHARA array on Mt. Wilson near LA in CA is good enough to show a dark disk move over the bright star: The images zoom in enough to reveal the shape of the dark object's shadow. A geometrically thin, dark, dense, but partially translucent cloud can be seen passing in front of Epsilon Aurigae, demonstrating that the basic paradigm for the eclipses was right, although the disk appears much flatter than recent modeling from the Spitzer Space Telescope suggests. A lot of coverage here, here, here, here, here, here, here, here, here, hier und hier, further discussion here, here and here and the light curve. The Venus/Mercury pair "dominated" the other news in the past week, with the latter fading rapidly in the last few days: selected images of today from Germany, yesterday from Canada and Germany (more), April 9 from the U.S. (more) and Germany, April 8 from Austria and Germany (wide view with Mars included! ), April 7 from the U.K. (more, more) and Germany, April 6 from Austria and Germany (with the Pleiades and some effects; more, more, more, more and more, also the 2 preceding ones), April 5 from the U.S., U.K., Spain and Germany (more, more and more, also the 4 preceding ones), April 4 from the U.S. (more) and the U.K., April 3 from the U.S. and U.K., April 2 from Austria and Germany (more and more) and April 1 from Germany (timelapse video). 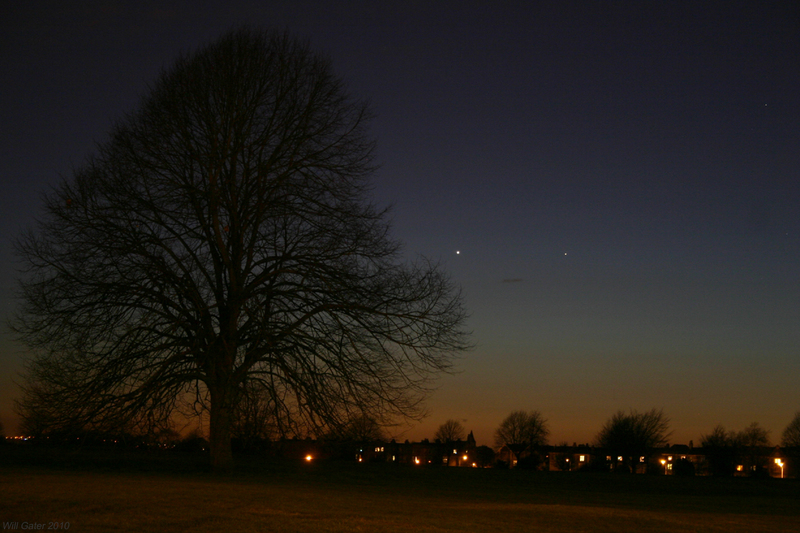 One of mine also made it into this collection and Venus and Mercury were resolved in daytime observations - plus the future of Venus this year. • Mars is now in the Beehive; images of April 10 (also a drawing), April 6 and April 2 and Saturn on April 8 (more and more, incl. an animation). 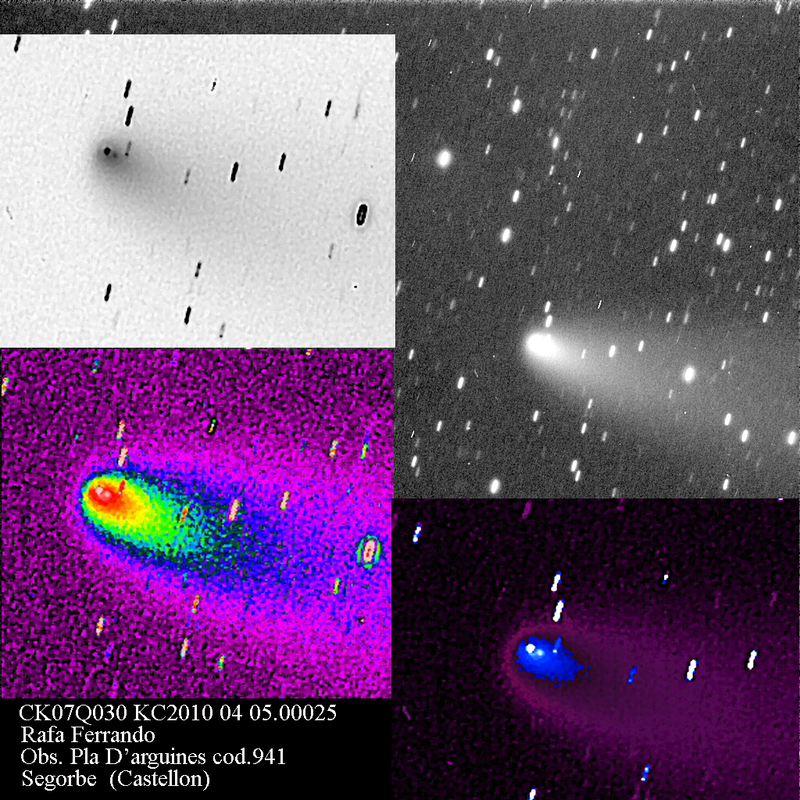 In yet other news another sungrazing comet came and vanished (animation, story, still), images of 81P/Wild of April 10, April 9, April 8 (more), April 5 and April 4, with a substantial dust tail, split C/2007 Q3 (Siding Spring) today (processed), on April 9 (more, processed), April 5 and April 2, also Machholz and a new Boattini. • A proposal regarding a lower size limit for dwarf planets made headlines here and here, Quaoar is very dense, a minor planet came close, a meteorite hit a car in Canada, others were found after the Feb. 28 bolide, a visit to the Hoba meteorite and a JPL Release advertising meteor showers. • From the Jan. 15 annular eclipse in India a new Baily's Beads movie from the edge and a slide show from Kanyakumari. • The profile of asteroid Anastasia from an occultation of a bright star (most missed it), and a video of a short grazing occultation by the Moon. • A faint aurora was seen over N. Germany (more; story), plus spot 1057. • A video and a picture (report) of the ISS crossing the Sun and a picture of the ISS over the Moon (more). • The aurora from the ISS (later). • And phenomenal cloud FX after the last STS launch, discussed hier, here, here, here, here, here, here and here. April 3 (Americas) or April 4 (Europe): Closest approach of Venus & Mercury, about 3°, though technically this is 'only' a quasi-conjunction as at no time do Mercury and Venus have the same right ascension or ecliptic longitude. Night April 5/6: For the western USA and Alberta a naked-eye star will be occulted by a big asteroid in the brightest asteroidal occultation ever predicted for North America involving an asteroid this large. April 9: Greatest Eastern elongation of Mercury (19.3°), but the planet has faded quite a bit by then. April 15: Just as Mercury's evening apparition ends (~April 18; inferior conjunction is on April 28), the crescent Moon is close by (only 30 hours old when dusk arrives in Germany) to the now pretty faint planet at +1.4 mag. 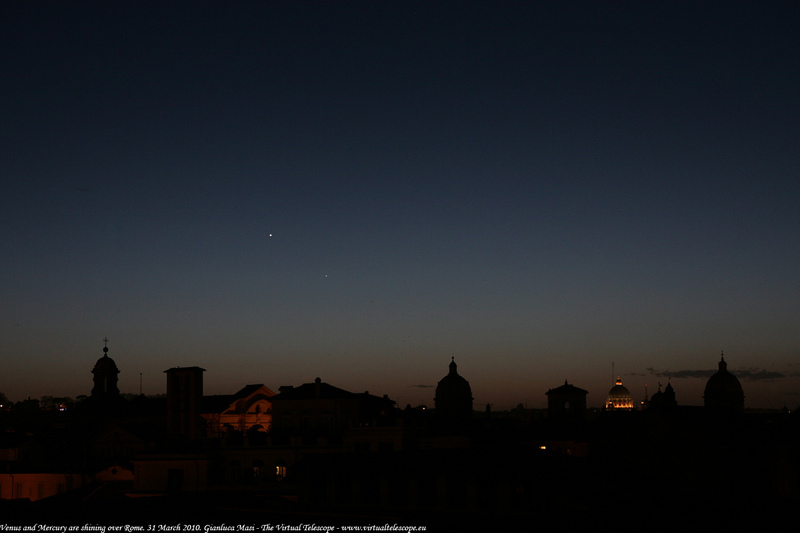 April 16: Moon close to Venus. April 16 to 18: Mars passes through the Beehive cluster (and the April 21 the Moon is nearby). Night April 22/23: Peak of the Lyrid meteor shower; the 1st quarter Moon sets early enough. Not a high ZHR usually, but outbursts possible. In other news a close-up of AR 11057 on the Sun (which looked like that today was a source of radio emission) and thoughts about the solar cycle from ESA and Space.com. • Comet views & news: 81P/Wild on March 25 and March 24, P/2010 A2's streak on April 1 (no changes! ), a newspaper story and an observers' note on comet Machholz, and a March 25 picture (not showing it) and another story about the break-up of Siding Spring. • More on a meteorite fall in Hungary (already mentioned). • Mars on March 23. • The Moon with extreeeme refraction as seen from the ISS (and without any a bit later) - and countless pictures of the ISS from the ground.